In this demonstration, I will share with us on how to connect two offices together using Mikrotik MPLS with VPLS. This demonstration has been simplified to give readers the foundation they need to delve into the exciting world of Mikrotik MPLS with vpls. Mikrotik MPLS with VPLS configuration, as used in this demonstration, will allow the use of mpls for packet-switching and vpls for transparent layer 2 commnunication between our branches. A lable-switching path (LSP) comprising of three Mikrotik routers will be created with OSPF as the igp. In a nutshell, this demonstration on how to setup a layer 2 mpls to connect two branch offices. The objective of this lab is to allow transparent connection from PC1 to PC2. The customer does not need to see hops between branches. On the provider router, we assign IP addresses to interfaces, configure ospf for reachability, and finally, enable mpls and mpls ldp on participating interfaces. Let’s jump in! 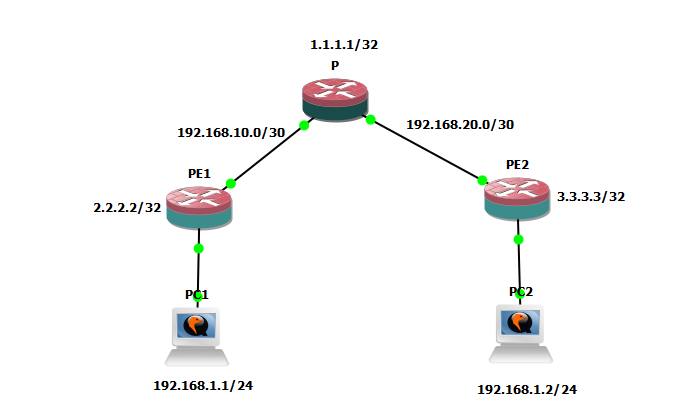 Create a bridge for mpls ldp peering and assign IP addresses to interfaces. Enable mpls and mpls ldp on interfaces connecting to provider edge routers. Enable OSPF to advertise loopback and physical IP addresses. At this point, our lsp is fully established with labels to advertised destinations. Let’s see the mpls forwarding-table of PE1 router. The image above shows the labels that have been assigned to reach networks 1.1.1.1/32, 192.168.20.0/30 and 3.3.3.3/32. All three networks are reachable through ether1. Everything looks good. Now, let’s enable vpls on PE1 and PE2 routers to enable PC1 and PC1 establish transparent connection to each other. To verify this configuration, we will assign IP addresses from the same network to PC1 and PC2 and try to ping across. PC1 has been assigned the IP 192.168.1.1/24 while PC2 has been assigned 192.168.1.2/24. Let’s verify. From the image above, we can see that the IP on PC1 is 192.168.1.1. We can also see the results of traceroute and ping tests to PC2. ← Using a /31 subnetmask for a point-to-point link. Wrong or smart move?